Narcotics kill pain, causing effects like heroin addiction. Narcotics like heroin, morphine, codeine and medication that are synthetic opiates like Demerol and fentanyl are addictive. These opiates, work by mimicking the pain-relieving chemicals produced in the body. They bind chemically to opiate receptors, activating pain relieving systems in the brain and spinal cord, but they can cause undesirable side effects. Side effects: nausea, sedation, confusion and constipation. With use, individuals become tolerant to the drugs and require larger doses. They can become physically dependent – in other words, become addicted. Opium, the bitter dried juice of the opium poppy, has been used for centuries to relieve pain. 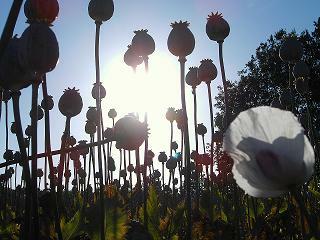 Opium’s active component comes from morphine. This is a highly addictive drug and a serious problem in America. Current estimates suggest that nearly 600,000 people need treatment (link) for addiction. There are studies that suggest a shift from injecting to snorting, or smoking because of increased purity and the misconception that these forms of use will not lead to addiction. This drug is associated with serious health conditions: overdose, spontaneous abortion, collapsed veins and diseases including HIV/AIDS and hepatitis. Short term effects: after the ‘rush’ accompanied by a flushed feeling in the skin, a dry mouth and heavy extremities, the user goes “on the nod’ – an alternately wakeful and drowsy state. Mental functioning becomes clouded. Long term effects: Users may develop collapsed veins, infection of the heart lining and valves, abscesses, cellulites, and liver disease. Pulmonary complications including pneumonia may result from poor health conditions. Street heroin may have additives that do not dissolve and result in clogging the blood vessels that lead to the lungs, liver, kidneys or brain. This can cause infection or even death. Tolerance: With regular use tolerance develops and the abuser must use more to achieve the same effect. As higher does are used, physical dependence and addiction develops. Withdrawal may occur within a few hours after use. Symptoms produce: drug cravings, restlessness, muscle and bone pain, insomnia, diarrhea and vomiting, cold flashes, goose bumps, kicking movements and other symptoms. Major withdrawal symptoms peak between 48-72 hrs and subside after about a week. Sudden withdrawal is occasionally fatal, although heroin withdrawal is considered less dangerous than withdrawal from alcohol or barbiturates. Treatment: Methadone blocks the affects of heroin for approx. 24 hours. This drug has a proven track record. LAAM can block the effects for up to 72 hrs. Nalox and naltrexone block the effects of morphine, heroin and other opiates and other medications are under study. There is residential and out-patient treatment for narcotics and cognitive-behavioral interventions which modify the patient’s thinking, expectancies and behaviors and increase coping with life’s stresses. There is information on individual health insurance available for plans that may pay for treatment of addictions. Women suffer from addiction differently than men. Narcotics Anonymous provides a good source of support system. Counseling alone is ineffective with an active narcotic user, but once off narcotics, it is an essential part of follow-up care.